It's nice to stall a bit, but if you're struggling at this point it's probably too late. Still potentially useful though. This card plus lots of the 6 cost societies could let you mount a great comeback, especially if you pack Negotium to prevent rush. Worth a look but has to be built around. There are a few cards that make the game continue past 3 stories, using this tactic can change 700 steps from being a late game card to a middle game card. this needs combining with other cards to make it useful (unending festivities, societies, plague stone). 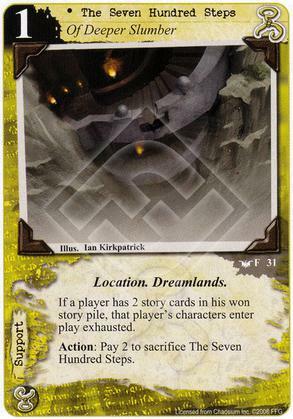 Overall I'm not a fan of this card but I could see it used in a very specific deck. Does this mean exactly 2, or 2 or more? I honestly can't believe the authors of this game were able to make it so mind-boggling ambiguous. If you have 3 story cards then by default you also have 2 story cards, so it would be 2 or more. The reason why it doesn't say 2 or more is because there are very few corner cases in which having more than 2 stories would result in you not having won the game.